I'm not a big New Year's Eve person, mostly because I find it nearly impossible to keep my eyes open until midnight! This year, however, we have a wedding to attend so maybe, just maybe, I will stay up to ring in the new year. We'll see! 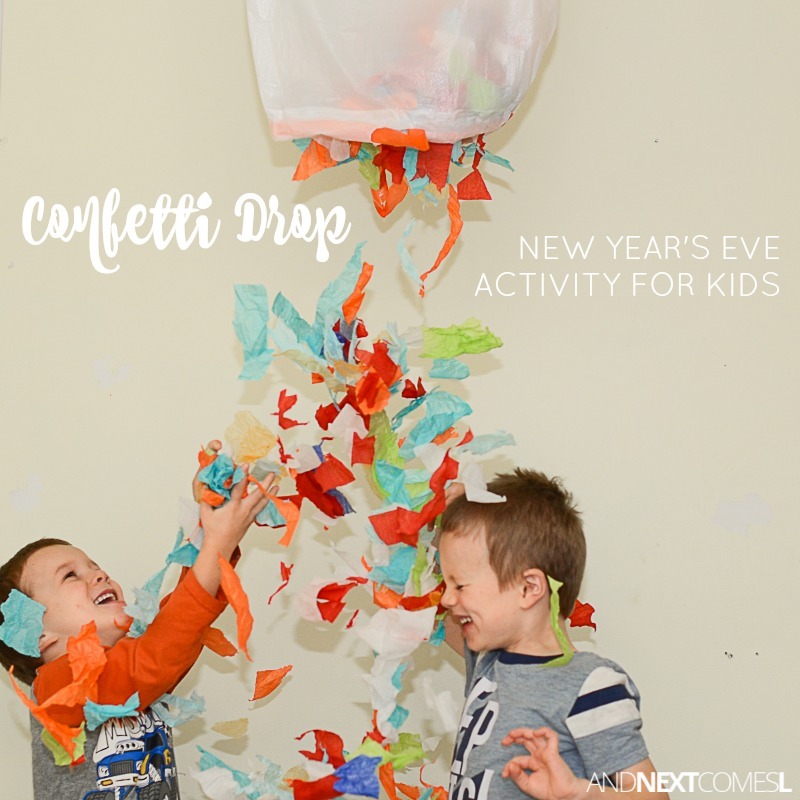 To celebrate New Year's Eve with the kids, we like to do this confetti drop as a substitute for the ball drop. My kids just love it because it's slightly messy and can be done over and over again. 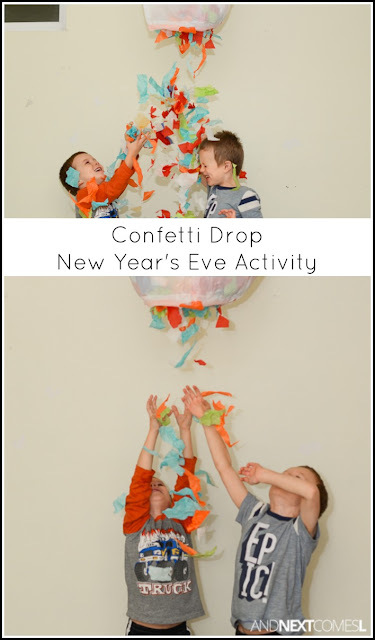 This DIY confetti drop for kids is a perfect sensory friendly New Year's Eve activity for kids with autism or sensory issues because it's not filled with the sights and sounds that most New Year's activities for kids are. 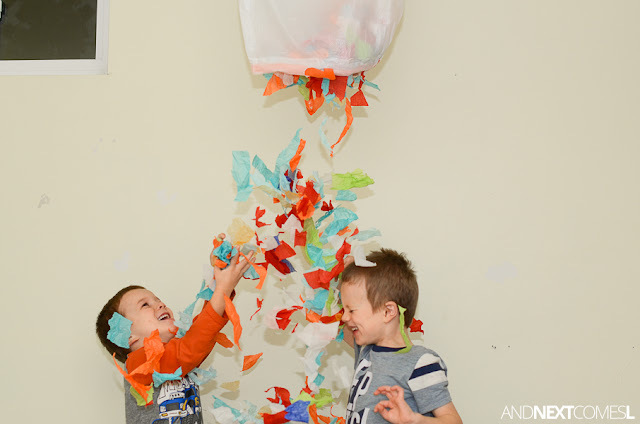 Plus, it's a great way to use up leftover gift wrap, tissue paper, ribbons, etc. from Christmas! 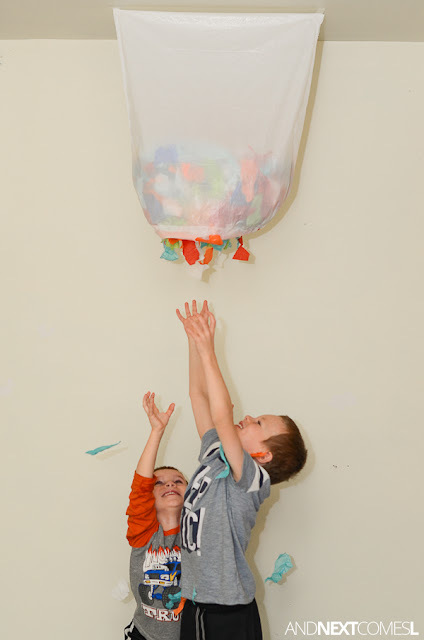 Or try filling it with balloons instead! 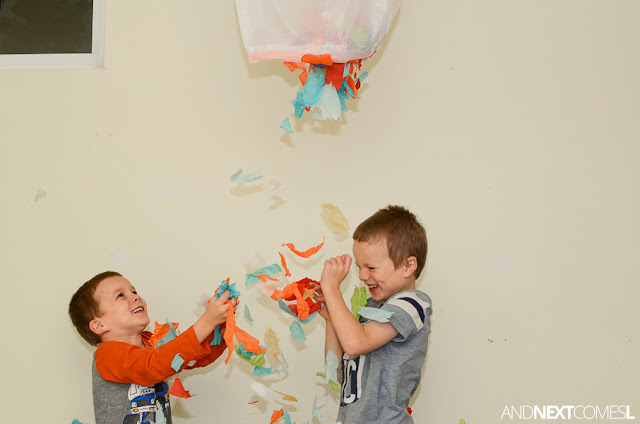 Tissue paper, ripped into small pieces - As an alternative, you could use the ripped gift wrap, ribbons, and bows from Christmas or blow up a bunch of balloons instead! 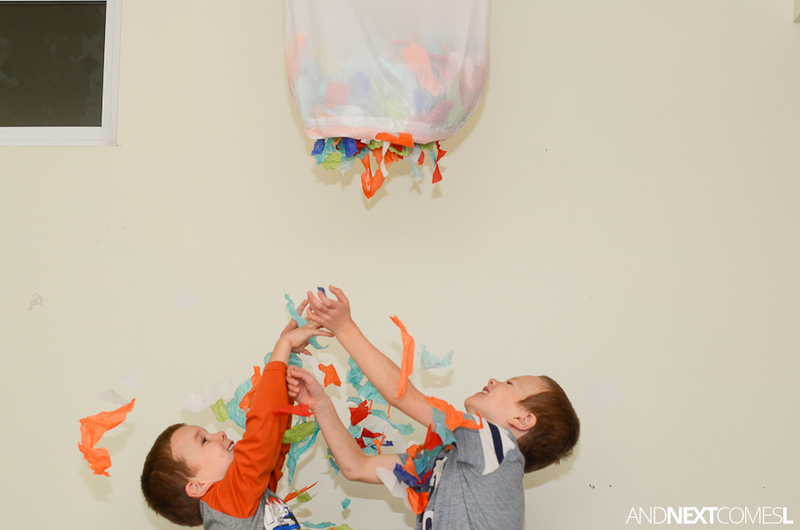 For our confetti drop, we reused some tissue paper from Christmas presents. 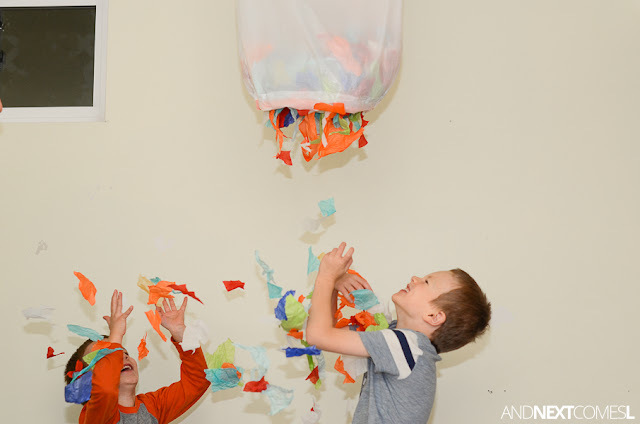 The kids and I ripped the tissue paper into smaller pieces, which is a great way to work on fine motor skills with kids, especially kids who are particularly destructive. 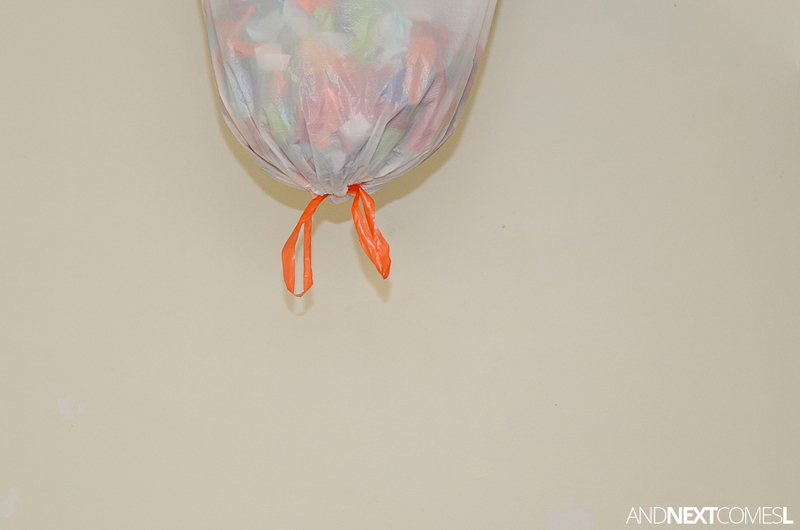 Fill the garbage bag with the ripped pieces of tissue paper. Tie the bag closed. Then hang the bag upside down from the ceiling. Secure the bag to the ceiling with some tape. My kids trying jumping to untie the bag, but it was slightly out of reach. So, since my husband is on holidays, he had the special job of untying the bag while I snapped photos. It's nice to have an extra set of hands for activities like this. 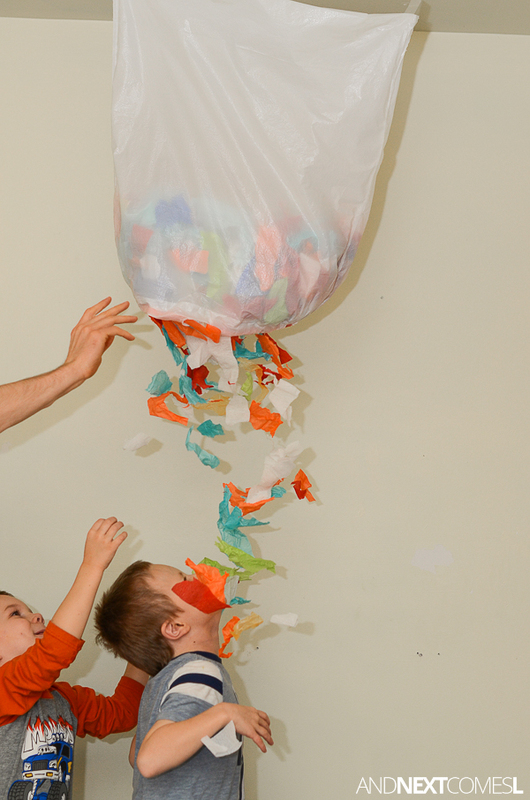 Once the bag is untied, the bag may need a small shake to get the confetti dropping. And the kids had an absolute blast. Hence, the sheer amount of photos coming your way below. The smiles on their faces were priceless as the confetti showered them. Once all the confetti falls out, load up the bag again to do it all over again! 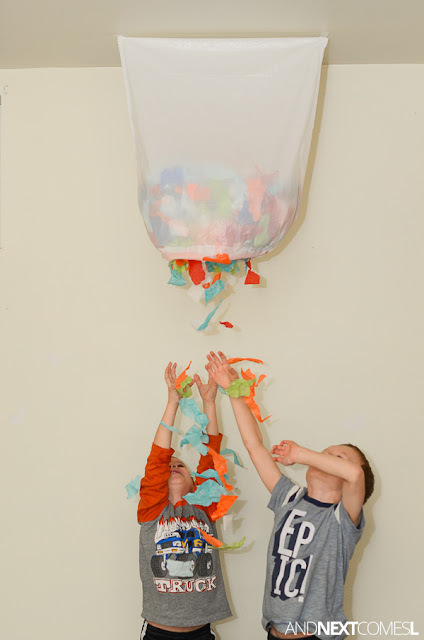 My kids were even excited to refill the bag with confetti that's how much fun they had with this activity! I have been browsing you blog and i must say your ideas a creative out the box and have been a inspiration to me, Awesome and thanks.